ATLANTA (November 3, 2017) — Organic revenue growth for agencies and brokerage firms stalled in the third quarter of 2017, falling to 3.9% from a surprisingly strong 4.6% reported in the second quarter. Even as growth fell, profitability continued to soar in the third quarter. 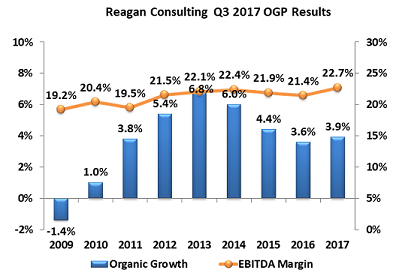 Firms participating in Reagan Consulting’s Organic Growth and Profitability (OGP) Survey did report several bright spots regarding growth, however, noted Jim Campbell, a partner at Reagan Consulting, a management consulting and merger-and-acquisition advisory firm for the insurance distribution system. “The OGP survey showed mixed growth by product line, with commercial lines continuing to struggle. Group benefits led the way at 6.3%. Personal lines growth, while lagging other lines, reached 3.0% — the second highest rate for the third quarter in the nine-year history of the OGP,” Campbell said. “Third-quarter organic growth declined from a recent Q3 high of 6.8% in 2013, but the slight increase from 3.6% in the third quarter last year suggests that agencies and brokerage firms may have bounced off the bottom and will see improved growth ahead,” he said. Pricing is still a challenge in many property-casualty lines, though trends appear to be moving in a favorable direction, Campbell said. Economic growth is also showing signs of strengthening, with the latest estimates from the U.S. Department of Commerce reporting back-to-back quarters of GDP growth of at least 3%. Profitability, which Reagan Consulting defines as agent-broker earnings before interest, taxes, depreciation and amortization (EBITDA), hit a median of 22.7% in the third quarter. “Not only is profitability up from 21.4% in Q3 2016, but this year’s EBITDA margin is the highest Q3 margin in the OGP survey’s history,” Campbell said. Agencies and brokerage firms can be “cautiously optimistic” that conditions for growth will continue to develop. “Sustaining current profitability, however, will take some work to improve structural profitability and not over-rely on contingent income,” Campbell said. For further information and commentary, contact Jim Campbell of Reagan Consulting at 404.869.2538 or jim@ReaganConsulting.com.